We know this is Canada… but investing into Outdoor Living has never made more sense. Remember when dad’s new gas barbeque was the highlight of the backyard? If you dream of your home extending into a three to four season outdoor living space, keep imagining. The sky is literally the limit. Whether you have a boutique-sized garden backyard in the City, or a sprawling acreage in the country, we can make your space an outdoor paradise. We have great options for automated systems that control outdoor lighting, retractable window open-air rooms, outdoor theatres, integrated sound, pool and spa options, and more. And we can make it all work from one-touch screen panels or from your smart phone. Worried about keeping your technology outdoors year round? 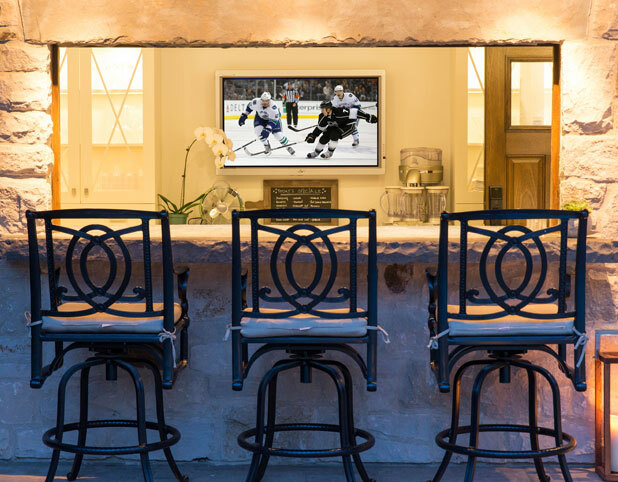 We have television and sound systems that are built to withstand rain, heat, and even the coldest Canadian winters. Thinking of the cottage or chalet? We love going north and can help you design the various spaces that make your weekend getaway unique; designing and integrating your entertainment, security and comfort indoors and outdoors at the cottage, boathouse, dock … even on your boat!